The adenoids are a small lump of soft tissue at the back of the nose. They are part of the immune system, just like the tonsils: they can be thought of as the “tonsils of the nose”. The adenoids, lying at the back of the nose, act like a sentry point for the nose, picking up virus and bacteria particles which are breathed in, and relaying these to the immune system. The tonsils do the same for the throat. The adenoids, like the tonsils, tend to be very small in babies, but grow significantly in toddlers and pre-school children. They tend to be smaller by secondary school age, and have usually shrivelled away by adulthood, although they may occasionally persist. In reality, the adenoids may need to be removed for a number of reasons, sometimes even in very young children. We believe that the adenoids, like the tonsils, are important in the developing immune system in infants, but they may have less benefit after about two or three years of age. Although there has not been a lot of evidence to support these assumptions in the past, a very recent study (click here to view) has suggested that removal of the tonsils (and adenoids) may be associated with higher chances of other medical issues in the future, such as allergies, asthma and chest infections. So adenoid and tonsil surgery should be considered only if they are causing significant problems and if there are no obvious alternatives to surgery. Cross section of the head. The adenoids (also known as the pharyngeal tonsil) are at the back of the nose, shown in green. What problems can the adenoids cause? Young children rely heavily on their noses for breathing. Large adenoids may cause significant blockage at the back of the nose. This often results in children “mouth breathing”, with blocked and mucus-filled noses during the day, and snoring or even sleep apnoea at night. This may be particularly bad when children have colds. Examination of the front of the nose may show no inflammation or abnormality at all: the problem is at the back of the nose. If, on the other hand, the nose is inflamed at the front, this may suggest nasal allergy, so that some medical treatments might be useful. The adenoids, lying at the back of the nose, sit right next to the openings of the Eustachian tubes, which connect the back of the nose to the ears each side, allowing us to “pop” our ears. Large adenoids may directly block the Eustachian tubes, resulting in problems “popping” the ears (equalising middle ear pressure), which can lead to fluid accumulation underneath the ear drums (glue ear) and middle ear infections (acute otitis media). Inflammation and mucus accumulation around the adenoids (called “adenoiditis” in the USA) may also impair the function of the Eustachian tubes in other ways. In fact, there is good evidence that removal of the adenoids (adenoidectomy) is effective in the treatment of glue ear, even if the adenoids are small. In particular, adenoidectomy is known to prolong the beneficial effects of grommets. The possible benefits of removing the adenoids for repeated ear infections are not as clear, and should be considered on a case-by-case basis. Having a blocked, mucus-filled nose is generally quite uncomfortable for young children, and it can also reduce their sense of smell and therefore quality of life. Although the adenoids are traditionally often removed along with the tonsils (adenotonsillectomy) in children with repeated tonsillitis, the benefits of removing the adenoids purely for throat infections are not proven. Such decisions should be considered on an individual basis, bearing in mind other symptoms such as a blocked nose. The history of adenoid-related problems, taken from parents and carers, is particularly important. The adenoids are difficult to examine, because they lie at the back of the nose. Some older children will allow examination of their noses with a small telescope (endoscope) in clinic, but in younger children we rely on simply looking into the nose with a torch. This will show whether or not the nose is inflamed or mucus-filled, but it is unlikely to reveal the size of the adenoids. Some doctors use X-rays of the head, taken from the side, to estimate adenoid size, but these are not especially reliable, particularly in little ones who wriggle about. This leaves us, in many cases, to assume that the adenoids are large and causing problems, based mainly on the history of parents and carers. The circumstances of each child should be considered on an individual, case-by-case basis. Some children will have worse and more persistent symptoms, while others may only have occasional problems, during colds for example. It is worth remembering that the adenoids will usually get smaller with time, although this may take several years. Some children, especially those with nasal inflammation and/or allergies, may benefit from anti-inflammatory nasal sprays (such as Flixonase). Saline drops and occasional decongestant sprays may also help on a short-term basis, eg during colds. Antibiotics (including low-dose, preventative treatments) are not proven to help with adenoid problems on the whole, but are sometimes considered in certain cases. But if adenoid-related symptoms are more severe, it is less likely that these sorts of non-surgical measures will make much of a difference. Removal of the adenoids may then be necessary. Why remove the adenoids: what are the benefits? The adenoids are removed by a small operation under general anaesthetic, which lasts about 15-20 minutes. This is performed completely though the mouth, which is held open with a metal spacer (a “gag”). This is usually possible as a day case, but overnight admission in hospital may be required in children with severe symptoms, other medical problems, or those living more than 30 minutes from the hospital. Traditional Curettage: a metal scraper (a “curette”) is passed through the mouth, round the back of the soft palate, to the back of the nose, and the adenoids are scraped away. Electro-cautery (suction monopolar diathermy or Coblation) : an right-angled electric probe is passed through the mouth, round the back of the soft palate, to the back of the nose. A small mirror is used to be able to see the adenoids, and the electric probe is used to cauterise the adenoid tissue away. At the same time, this cauterises any bleeding points. 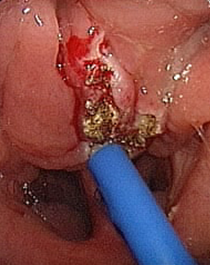 Removal of the adenoids using electro-cautery (seen with a mirror looking round the soft palate). The dark areas are the backs of the nostrils. Different surgeons will prefer different methods. In fact, there is no strong evidence that any particular technique is better than another. The most important consideration is that the surgeon uses a technique with which they are familiar. What are the risks of adenoidectomy? Persistent or recurrent symptoms. Adenoidectomy may not completely eliminate a blocked nose, snoring, glue ear etc. The symptoms may persist. Alternatively, the symptoms may improve for a while and then get worse again (recurrence). Adenoid re-growth is sometimes seen. Snoring and nasal blockage will improve after surgery, but symptoms may then start up again after several months. If this is the case, please contact your GP to organise another referral to an ENT specialist. Discomfort after surgery. Children may be a little uncomfortable for a day or two, but simple painkillers (paracetamol and ibuprofen) should settle this. Bad breath (halitosis) is common for a few days after the adenoids are removed using electro-cautery. This is because the back of the nose is slightly charred. The smell usually settles after a few days, and antibiotics are often given after adenoidectomy to reduce the smell. Bleeding during adenoid removal is rare, but can be heavy. This may be due to underlying clotting problems. Therefore, please let your ENT specialist know if your child or any family members have a history of clotting problems or excessive bleeding or bruising. Very rarely, a gauze pack needs to be left in the back of the nose after surgery to help stop the bleeding, and is removed after a day or two, usually with another general anaesthetic. Bleeding from the nose may very rarely occur following adenoidectomy after discharge from hospital. Tiny streaks of blood, mixed with mucus, may be seen when children blow their noses within a couple of days of surgery. This is common, and usually needs no further action. In the very unlikely event that bleeding from the nose is heavy, please pinch the soft part of the nose and sit your child up and forwards, encouraging them to spit out or swallow any blood clots. Apply a bag of ice or frozen peas (in a T-shirt) to the forehead and neck and arrange to go to your nearest A&E immediately. You may need to call 999 for an ambulance. In hospital, your child will be stabilised and referred to the ENT team on call. Damage to the lips, teeth and gums occurs rarely during adenoidectomy, because of the metal instruments which are inserted into the mouth. Please let your surgeon and anaesthetist know if your child has any loose, decayed or chipped teeth before surgery. Nasal escape of air and fluids. When we speak or swallow, the soft palate at the back of the throat lifts up and presses against the back of the nose. This closes off the back of the nose, and stops air hissing out through the nose when we make consonant sounds (like in “pepper” or “sausage”), or fluids when we are drinking. In children with large adenoids, the soft palate usually presses against the adenoids themselves to close off the nose. Very rarely (once in many hundreds or thousands of cases) when the adenoids are removed, the soft palate does not quite reach the back of the nose, and so air hisses out of the nose during speech, and sometimes fluids when swallowing. This is called velopharyngeal incompetence or VPI. This may settle on its own, but sometimes requires speech therapy or even (very rarely) corrective surgery for the palate. This is much more likely if the child has a history of cleft palate repair or other palate problems, or if there is a family history of these conditions. Please tell your ENT specialist if this is the case. Children usually recover very well after adenoidectomy, and are fit to resume normal activities within a couple of days. Some surgeons prefer that their patients are off school or nursery for one week, but I am usually happy that children can go back after two days or so, as long as they feel well enough. Paracetamol (Calpol) and ibuprofen (Nurofen) syrups should be used regularly four times a day for the first couple of days after surgery, and then afterwards as required for about a week. Any halitosis will usually settle within a few days with the antibiotics provided.